It was my birthday yesterday and I had a super time scooting around London. Mum and I went shopping and we picked up some bargains. We rested our weary bones at Sketch on Conduit St, a place I’d read about while working on Foodepedia. The brainchild of Mourad “Momo” Mazouz, Sketch is a place where food, art and music fuse to make a truly unique experience in an unexpected place. The food was OK, and the decor was exciting but the thing that held my fascination were the toilets. I know…I’m a simpleton. The toilet I went to consisted of a large white room where at the top of a curling white stair case stood a collection of white, egg shaped pods. The toilets were inside the pods and were lit only by a soft, pink light. It was mental. Anyway, enough about toilets, I also happened to spend the evening at The Savoy with AT. We drank Mint Juleps at The American Bar (the oldest cocktail bar in London – dare I say the world!) 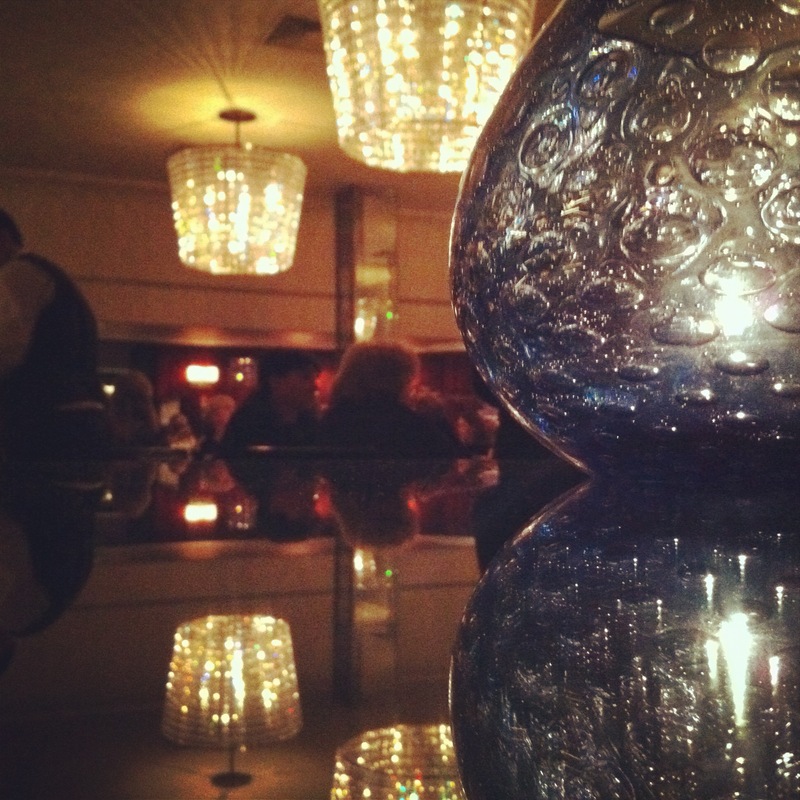 where the likes of Frank Sinatra and Winston Churchill threw back a martini or two. Then we made our way down to the Savoy Grill where we dined on the Gordon Ramsay designed menu and again in a space where countless celebrities and politicians have supped. I won’t go into the details of the meal, it was lovely but a little rich. When will I learn that I don’t need 3 courses? The standard was as excellent as I expected and there was not a complaint to be had. The hazelnut souffle was as light as air and a delight to behold and my Nashi cocktail was possibly THE best cocktail I have ever tasted. The reason I really wanted to post about my birthday actually was to share this lovely birthday spread that my mum and sister prepared for me. Cakes were bought at Yotem Ottolenghi, an Israeli chef living in London with a few delis/restaurants around the place that sell his famous salads and delectable desserts. I am currently experimenting with the lovely vegetarian recipes from his book Plenty and believe him to be one of the most progressive and exciting chefs around these days. What you can see in this photo is an apple cake, a chocolate cake with Bailey’s cream that was TO DIE FOR, a brownie that was out of this world, a cheesecake with cranberries and pistachio and a lemon curd tart. All were exceptional. What I liked the most though was the presentation. 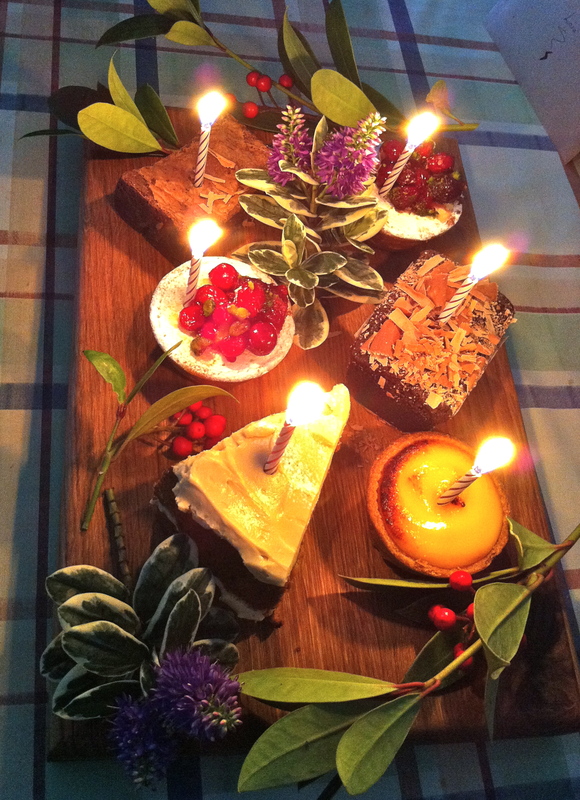 These little delights were laid out on a chopping board we bought for mum her birthday last week and decorated with seasonal sprigs. That’s love right there folks.